Was born in 1852, and educated at Liverpool. 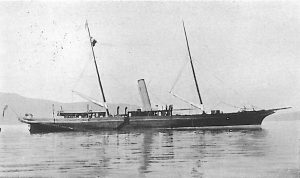 He is a member of the family of MacIvers of Liverpool, whose name is so well known in connection with shipping business. His forefathers for genera­tions were seafaring men, fighting to defend the country, and in doing which they earned high reputation for their skill and gallantry. His uncle and father together founded the Cunard Line, and the family are all enthusi­astic in their taste for the sea. Mr. Harry Maclver spent all his early years at sea. With characteristic pluck and energy, he became master of the elements of navigation, and when the Board of Trade announced their intention of issuing a master’s certificate for yachtsmen, Mr. Harry Maclver and his brother, Mr. Charles Maclver, were the first to be examined. The former was just of age, and eligible for examination. 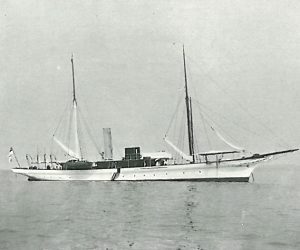 The story has often been told of the surprise of the chief examiner when he discovered Harry MacIver’s knowledge of seamanship was much more than equal to the then exacting conditions of the Board of Trade. 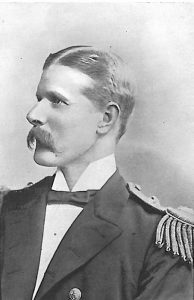 In 1879 he obtained the commission of Lieu­tenant in the Royal Naval Reserve, and in 1890 became Commander. He always com­mands his own yacht, the Columba, 300 tons, and on board this boat and the Vanadis and Deva he has made many long voyages.